VLOOKUP function is one of the most popular functions in Microsoft Excel. It is reasonably important to be familiar with the common problems involving VLOOKUP and learning how to solve them. This step by step tutorial will assist all levels of Excel users in solving common VLOOKUP problems. Our table consists of four columns: Employee ID (column B), Name (column C), Rating (column D) and Bonus (column E). In cells G3:H8, we have a table of ratings with corresponding bonus. 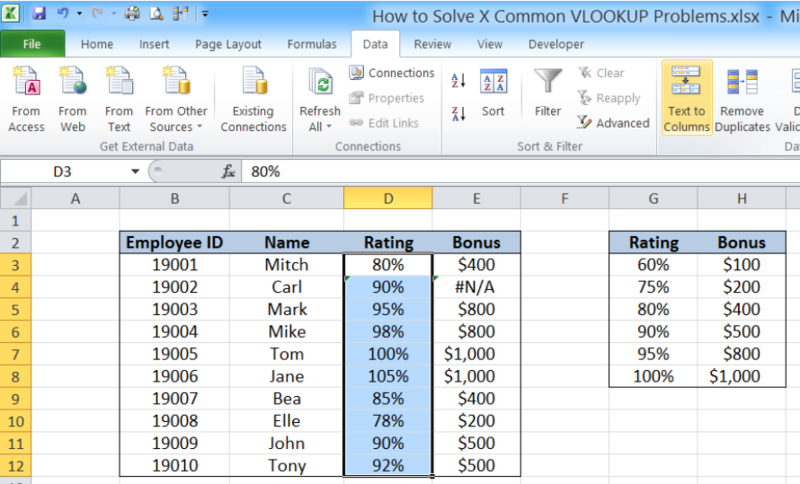 We want to lookup the rating and obtain the corresponding bonus per employee by using VLOOKUP. Results will be recorded in column E.
Our formula looks up the closest match for the rating in column D in the range G3:H8, then moves to the second column to the right and obtains the corresponding grade. The table below shows the bonus for each employee as supplied by the VLOOKUP function. One common problem with VLOOKUP is when values are mistakenly entered as text. See below example where cell D4 is entered as text, with an apostrophe at the beginning: ‘90%. As a result, the formula cannot find the lookup value in the range G3:H8, and the #N/A error value is returned instead. 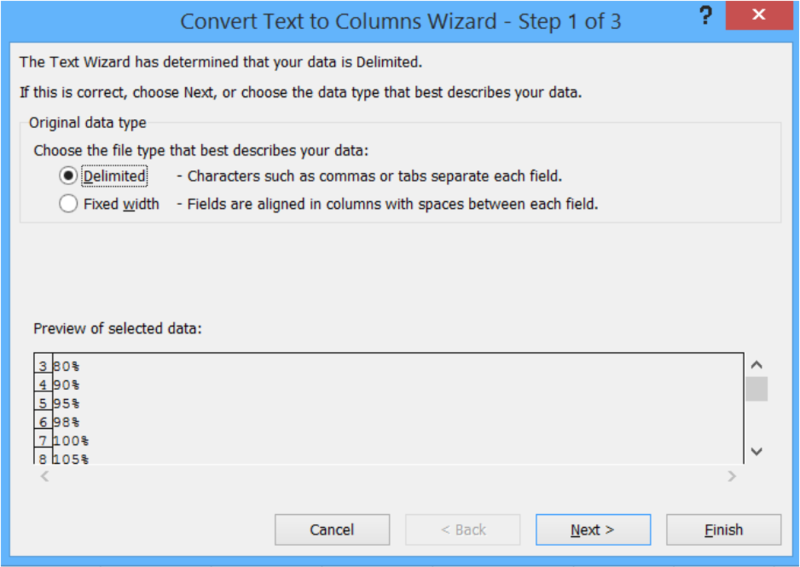 The Convert Text to Columns Wizard dialog box will pop up. We have now converted all the cells in D3:D12 into numbers. Another problem encountered with VLOOKUP is when a column or columns are added that affect the cells or range connected with the VLOOKUP formula. See above example where a column is added to the right of column G.
Note that the values for Bonus in column E have all been changed to 0$. Looking closely at the VLOOKUP formula, notice that the value for column index number remains at 2. This means that even if the Bonus column has been moved to column I, which is the third column in the range G3:I8, our formula still refers to the 2nd column. The COLUMN function subtracts the column numbers of H and G, which is 1, then adds 1, resulting to 2. Now, even if columns are inserted and the column for Bonus is changed, our formula will adapt with the change and still return the correct column number. Let us copy the formula in cell E3 to cells E4 to E12, then insert a column again to to the right of column G.
As shown above, inserting a column didn’t affect the VLOOKUP formula at all. The results in column E remain unchanged. The table above shows that the range_lookup used in the formula is “FALSE” instead of “TRUE. As a result, the VLOOKUP only searches for a perfect match of the rating. When a rating is not found in G3:H8, the error value #N/A is returned. The use of TRUE (approximate match) or FALSE (exact match) depends on the requirement of the user. In this example, we are searching for values in a table with defined ranges or cut-off values. The use of TRUE for an approximate match is necessary. Otherwise, using FALSE for an exact match would return errors for those ratings that fall in between the given cut-off ratings. The table above shows that the lookup value in column D containing the rating is not found in the leftmost column of table_array. The range for the table_array has been mistakenly entered as H3:I8 instead of G3:H8. It is very important to enter the table_array such that the leftmost column is the column where the lookup_value can be found. Otherwise, the VLOOKUP function will return an error value. Another common problem encountered with VLOOKUP is dragging cells to copy formulas without fixing the necessary cells for absolute reference. As shown below, cell E9 has the table_array G9:H15, which contains no values. Hence, the formula returns an error because it cannot find the lookup value “85%” in the table_array G9:H15. In this case, it is absolutely necessary to fix the cells G3:H8 because G3:H8 is the range that contains the data for the ratings and corresponding bonus. There is a degree of analysis that’s required when creating formulas and copying them to other cells. The cells that serve as references must be fixed with the use of the dollar sign “$” such that copying the formula in any direction would lead to the desired results.